"This is a tasty, treaty baby back ribs recipe, and it's real easy to prepare. Serve the remaining glaze with the ribs." In a large pot, bring the water to a boil. Season boiling water with 2 tablespoons garlic, 4 tablespoons Cajun-style seasoning, and 4 tablespoons seasoned salt. Boil ribs in seasoned water for 15 to 20 minutes. In a mixing bowl, mix together barbeque sauce, 2 tablespoons garlic, 2 tablespoons Cajun-style seasoning, 2 tablespoons seasoned salt, and Worcestershire sauce. 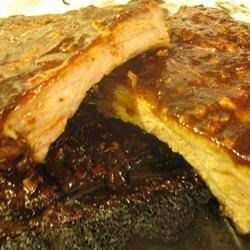 Place ribs in large baking dishes, and apply a generous amount of the barbeque sauce mixture to the ribs. Set aside for 10 to 15 minutes to marinate. Grill the ribs for 7 to 12 minutes per side, until nicely browned. Baked, marinated and grilled to juicy perfection!